Our rates, billing practices, and payment procedures are explained below. If you have any further questions, please contact our office. What rate do I pay? Residential sewer bills are based upon water meter information from January – March of the prior year. In the event water meter information is not available for a customer for the specified winter months, the customer is billed the median amount. The median amount changes annually based on prior years readings for all our customers. Additionally, the Missouri Department of Natural Resources has a fee of 6¢ per household, per month. How are the residential rates established? There are three components to RCPSD rate structure. The first is the base fee. The base fee is $73.29 per quarter. The base fee is used largely to pay off the $25 million in bond debt over the next 20 years. The variable fee is $2.57 per 1,000 gallons of water that is used. This represents the districts direct cost to treat the wastewater. It costs the district $2.57 for each 1,000 gallons of wastewater that is processed. The third component is a charge of 18¢ by the Missouri Department of Natural Resources (MoDNR). Example: Let us assume you used 18,000 gallons of water over a three-month period. 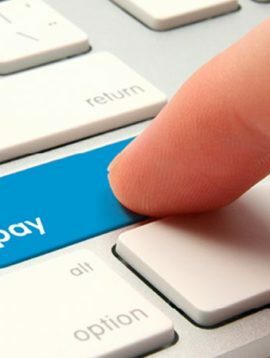 On-Line – Customers can pay their bill online from the drop down menu under “Billing & Payment” or by selecting the red “Pay Your Bill Online Here” button on the home page. There is a convenience fee charged to pay online. In person – Customers can pay in person at district offices at 4133 W. Outer Road, Arnold between 8:00 a.m. and 4:30 p.m., Monday through Friday, except holidays. If paying with a debit or credit card a convenience fee will be charged. Check By Phone – Customers can pay their bill over the phone by an electronic funds transfer. A fee of $1.00 is charged for payments that are made over the phone. These payments are processed weekly on Thursdays to post to your account on Friday. Bank draft – Customers may pay their bill by bank draft. To establish a bank draft, a copy of a voided check would need to be provided that shows the required routing and bank account information or a document from your bank with your name and account information. Click here for the Bank Draft Application. Drop Slot – Customers may also use the 24-hour drop box located at the base of the front door of the districts administration office at 4133 W. Outer Road, Arnold. Monthly payment of a quarterly bill will be accepted provided the monthly payment (equal to 1/3 of the quarterly bill) is paid by the 15th of each month of the quarter. Customers must use caution in using this option. The district will not send a bill monthly nor will a reminder be sent to the customer. How and when am I billed? Bills Issued – Sewer bills are sent out quarterly- January 1st, April 1st, July 1st, and October 1st. Bill Due Date – Payments of each quarterly bill are due by the 15th of the month. Accordingly, the January 1 bill is due by January 15th, the April 1 bill is due April 15, etc. Late Charge – Quarterly bills that are not paid by the end of the month in which the bills were issued (that is by January 31st , April 30th , etc.) become delinquent. A ten percent (10%) delinquency charge is made against all delinquent bills. The delinquency charge is made against the entire principal amount due and will appear on the next quarterly bill. Crediting – All payments will be credited to late fees and other charges prior to basic service fees regardless of customer request. Why was my water service or sewer service disconnected? Bills that are more than three months in arrears are subject to water or service disconnection for non-payment of sewer bill. Restoration of service and reconnection will take place only after all past due amounts, including the late charges, are paid in full. The entire cost of reconnection must be paid in full prior to restoration of service. Each public water district charges the district a disconnection/reconnection fee of $100.00. That fee is collected from the customer prior to authorizing restoration of water service. In the event a lateral has been dug up and capped by the district, all fees must be paid in full prior to being authorized to reconnect to the sewer system. The district will charge the customer its cost to dig up and cap the lateral. It will be customer’s responsible to pay a plumber or drainlayer to reconnect the lateral to the sewer system. How do I get a lien released? In addition to disconnecting water or sewer, the district may file a lien against the property for the total amount due. All costs to record and release the lien are charged against the customer’s account. The entire balance due must be paid in full prior to the release of the lien. It is important to have your lien cleared prior to the sale of the property or refinancing of the mortgage. How are commercial customers billed? Commercial customers are billed $73.29 per quarter base fee and $4.26 per 1000 gallons used as variable rate. Staff at RCPSD is available to help you Monday through Friday 8:00 am to 4:30 pm. at (636) 464-3305. For emergencies after hours, please call (314) 889-1904.